These are photos shared by Tamarack Stables and their clients. 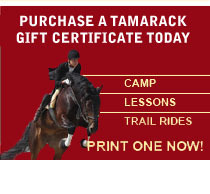 We would love to see your Tamarack Stables photos. Please register for a client account or login now and use the "Load Photos" link to share photo albums from your Google Picasa Account.